Trump Proposes Banning Devices that Make Some Guns More Lethal - Integration Through Media ....! (VOA): After recommending a ban on devices that can make firearms more lethal and calling for stronger background checks on gun buyers, U.S. President Donald Trump is hosting a "listening session" Wednesday at the White House with students, parents and teachers who have been victimized by mass shootings in America. Among those taking part in the session are students from Marjory Stoneman Douglas High School in Parkland, Fla., where a former student last Wednesday killed 17 people. More than 100 of the school's students are also rallying Wednesday at Florida's state capitol to call for gun control reforms. 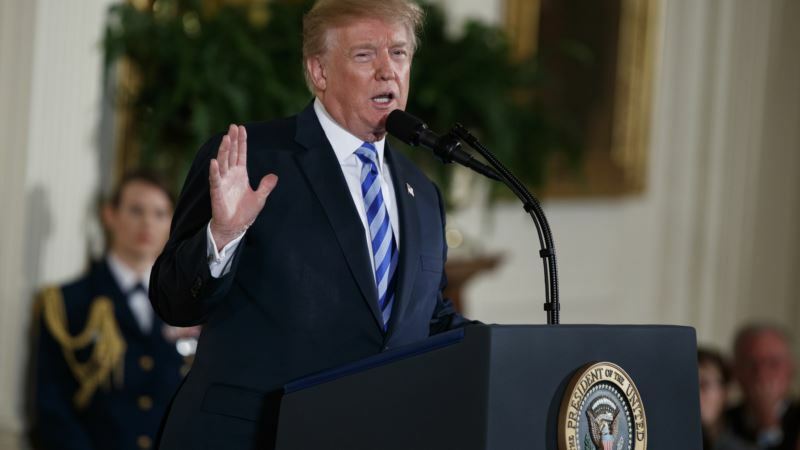 WATCH: Trump on bearing arms ​ Trump on Tuesday termed the shootings "an evil massacre" and later on Twitter said Republicans and Democrats both "must now focus on strengthening Background Checks!" In his first extensive public remarks on the Florida school shooting, Trump declared "school safety is a top priority for my administration," adding he will meet with state governors next week to discuss the topic. "We're working very hard to make sense of these events," Trump said to law enforcement members and other first responders during a White House ceremony. "We’re going to come up with solutions. It’s been many, many years, and there have been no solutions." The president unveiled a set of proposed regulations, including a ban on bump stocks — attachments that allow semi-automatic guns to be fired faster — that were used in the shooting in Las Vegas, Nevada, last October that killed 58 people and wounded 851 others. "Just a few moments ago, I signed a memorandum directing the attorney general to propose regulations to ban all devices that turn legal weapons into machine guns," Trump said Tuesday, adding that such regulations will be finalized "very soon." The White House is also saying age restrictions are on the table for the most popular semi-automatic rifle in the country. The administration indicated it is open to universal background checks for gun owners. Text of the memo also includes criticism of Trump’s predecessor, Barack Obama. "Although the Obama Administration repeatedly concluded that particular bump stock type devices were lawful to purchase and possess, I sought further clarification of the law restricting fully automatic machine guns," Trump said in the document. "Although I desire swift and decisive action, I remain committed to the rule of law and to the procedures the law prescribes," the memo added. "Doing this the right way will ensure that the resulting regulation is workable and effective and leaves no loopholes for criminals to exploit." The Trump administration and lawmakers are facing a backlash — including from some of the student survivors of the latest school mass shooting — that they are too focused on the mental health of gunmen rather than the weapons they carry. It has been noted by gun control advocates that many teenagers in America can legally purchase an AR-15 type assault weapon before they’re eligible to vote or drink alcohol. Twenty-eight of the 50 states have no minimum age requirement for owning a rifle. "I think that’s certainly something that’s on the table for us to discuss and that we expect to come up over the next couple of weeks," White House Press Secretary Sarah Huckabee Sanders responded at the first press daily briefing in a week, when asked if Trump believed there should be an age limit for the purchase of assault rifles like the one used in the Florida school shooting. "The president has expressed his support for the efforts to improve the federal background check system, and in the coming days, we will continue to explore ways to ensure the safety and security of our schools," added Sanders. Millions of gun owners, who support the National Rifle Association and other organizations that fight against restrictions on such weapons, believe that the Second Amendment of the United States Constitution guarantees unfettered access to guns. In the 2016 elections, the NRA gave $54 million in political donations, much of that during the presidential race. It is not unusual for some members of Congress to have individually received hundreds of thousands of dollars — even millions — from the NRA. While some Democrats are also recipients of the association’s money, the top benefactors currently are from the Republican Party.